Dress 6, originally uploaded by the workroom. 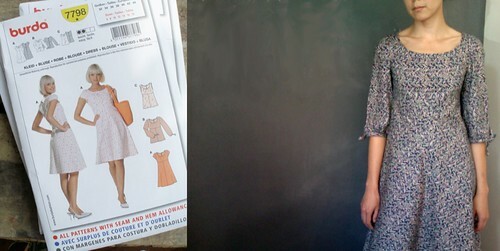 Burda patterns often require you to look past the questionable photos and styling to see the real shape of the garment. If you take a look at the pattern envelope of this one, you’ll see what I mean. This pattern has cute dart details around the neckline, an empire waist and a nice full skirt that is cut on the bias. I really liked the long, gathered sleeves with ties. I decided to create my own half sleeve that kept that detail. The dress itself was very simple to construct. The one hitch I ran into was finishing the slits on the sleeve. I spent over an hour re-reading the instructions, looking at the drawings and trying to figure out how the heck to make it work. In the end, I made up my own solution, which does the trick. The fabric I used is from a collection by Gerald E. Roy called Graphic Rhythms. Gerald interpreted the rhythms from music of different tempos into visual linear units and created repeating patterns. The navy fabric also matches my Hunter wellies, so this dress has become my rainy day dress. It all feels very British. Now, I need to get my hands on a navy brolly to go with. I wanted to let you know that I finally watched ’27 dresses’. You had to see that one coming, eventually. I was entertained, if only for the kinship to a girl with a closet full of dresses.